Choosing a robo-advisor can be daunting. This Personal Capital vs. Betterment Review will help you sort out the similarities and differences. Also, I have and account with Betterment and use the Personal Capital free investment and financial management dashboard! 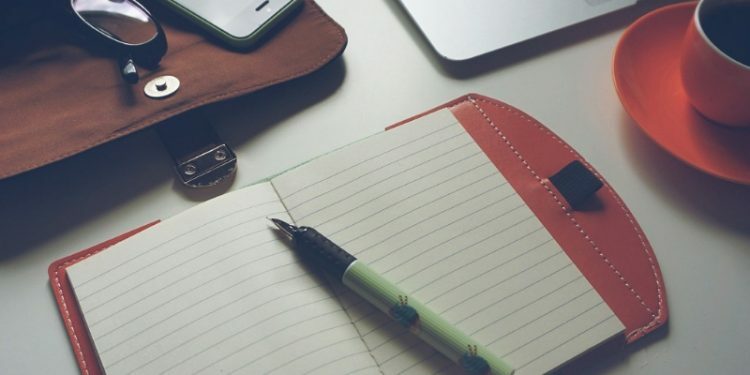 It’s essential to keep your financial goals in mind if you want to achieve them, and today’s featured robo-advisors will help you do just that. Betterment vs. Personal Capital Robo-Advisors —Who Benefits? Interested in Other Robo-Advisor Comparisons? Personal Capital and Betterment, two goals-oriented robo-advisors, may have been designed for different client types, but both keep your financial needs in mind and offer unique ways of setting and tracking financial goals. 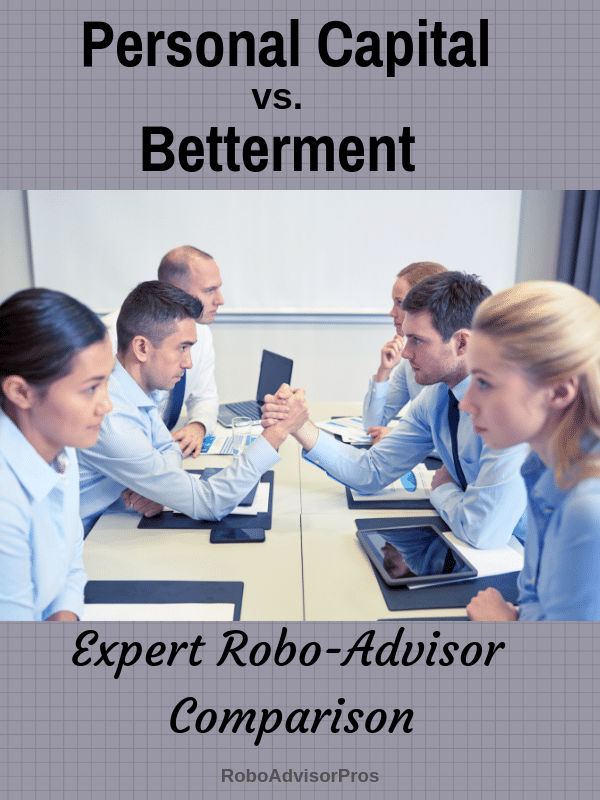 First, a quick overview of Betterment vs Personal Capital Robo-Advisor Features. Overview Personal Capital offers stellar free investment management tools. Their paid money management platform is comprehensive, & includes financial advisors for all. A goals based automated investment advisor. Betterment bills itself as, "Investing Made Better." Offers a variety of human financial planning options. Minimum Investment Amount No minimum amount for access to free tools. $100,000 minimum for access to paid investment management services. There is no minimum investment amount required. Fee Structure Zero fees for access to free investment management tracking & recommendations. Paid investment management charges graduated fees. For assets between $1,000,0000-$3,000,000 .89% of AUM. Fee drops to 0.49% for accounts over $10,000,000. Digital-0.25% AUM up to $2 million. Reduced fees above $2 million. Top Features Paid feature includes access to dedicated financial advisor. Investment & financial account analysis & recommendations, retirement planner, rebalancing, tax-loss harvesting, saving & spending tracker, retirement planner & more. Goal-based ETF investment portfolio. Rebalancing. Tax-loss harvesting. SRI, smart beta + income portfolios. Human financial advisor access. Free Services Spending, saving & investment transaction & performance reports. Retirement & 401(k) fee analyzers. Net worth tracker. Asset Allocation report. Recommendations for improvement & more. See promotions. Email-24/7 Phone and email support, 7 days per week. Investment Funds Free service-analyzes your existing investments. The paid Personal Capital Advisors invests in individual stocks (for large accounts) & stock, bond & alternative ETFs. Low-cost, commission-free ETFs. Accounts Available Individual + joint investment accounts. Roth, traditional, SEP + rollover IRAs. Trusts. Single + joint taxable brokerage. Roth, traditional, rollover + SEP IRA. Trust. Both of these robo-advisors help clients easily set financial goals. They also offer the best of the robo-advising features: portfolio rebalancing and review, a variety of investment options, and multiple account types. However, these two robo-advisors are much less alike than they would seem at first glance. 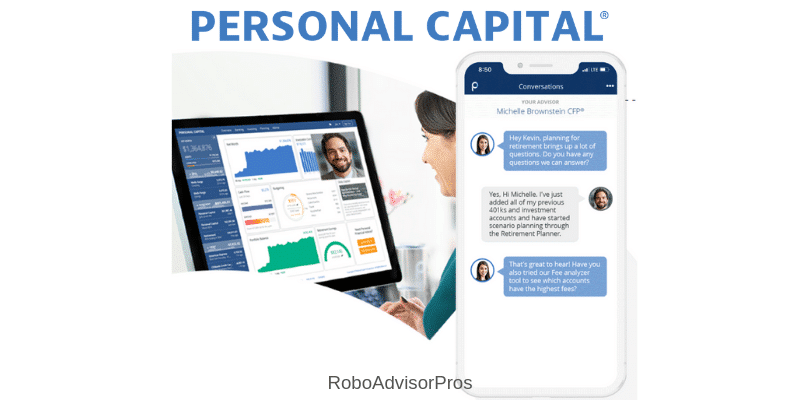 Personal Capital is a large robo-advisor, offering both free financial services (like their retirement planner) and paid investment services. The wide spectrum of services offered means that Personal Capital is a powerhouse of a robo-advisor. With a higher investment minimum for paid services, Personal Capital paid services is geared for the mass affluent user. In exchange for a higher entry point, however, clients experience personalized investment advice, the opportunity to invest in individual stocks as well as funds and other bespoke services. Betterment is goals-oriented, so clients begin their relationship with Betterment looking toward the future. This robo-advisor has fewer diverse services than Personal Capital, but that doesn’t make it the lesser robo-advisor—far from it, in fact. Betterment is highly praised in the robo-advisor realm for its accessibility and investment options. In fact, Betterment is the sort of robo-advisor that grows with its clients. It’s not uncommon to see Betterment adjusting its services in order to meet the changing needs of their investors with a la carte financial planning packages! These robo-advisors are customer-focused, offering a balance of free and premium services that offer increasingly personalized investment advice. Anyone can benefit from Personal Capital’s free financial planning tools. The retirement planner is useful at any stage of the planning process, and we love the financial trackers for retirees. When it comes to the paid services, however, only more financially well-off investors (with more than $100,000 to invest) can benefit from Personal Capital. If you have a large enough portfolio, however, these higher fees will buy you access to personalized financial advising services and attentive account management. Although, the Personal Capital annual management fee is lower than the typical financial advisory charge. Betterment makes itself more easily accessible to all users. While Betterment still has a higher minimum balance requirement for its Premium features, this robo-advisor is focused on affordability. No minimum balance requirement means that people at any stage of their investment portfolio development can gain access to a quality robo-advisor with human financial planner support via text messaging. To top it off, Betterment also offers financial planning sessions for set fees in order to better customize its services for its clients’ unique needs. When comparing Personal Capital vs. Betterment for fees and minimum investment amounts, Betterment is the clearly more affordable choice. Betterment Digital investors can open an account with no minimum balance, and charges middle-to-low range fees depending on their account type and balance. Although for access to video chat with financial planners, the Betterment Premium requires a $100,000 minimum, like Personal Capital. Betterment Digital clients will pay 0.25% AUM on accounts worth up to $2 million, or 0.15% AUM for accounts over this amount. Clients can also purchase a la carte financial planning sessions with professionals through Betterment at a rate of $150-$500 depending on the need. Personal Capital Advisors has a might higher entry point, with a $100,000 minimum investment amount. The Personal Capital fees are higher than Betterment, beginning at 0.89% AUM but gradually dropping as portfolios grow. Clients with accounts valued over $10 million, for instance, will only pay 0.49% AUM. Confused about which robo-advisor to choose? Answer a few questions and get a personalized recommendation with our Robo-Advisor Selection Wizard. Aside from the vast difference in fees and minimum initial investments, what is it that really sets these two robo-advisors apart? If you had to choose between Personal Capital vs Betterment, which better suits your financial needs? Even though robo-advisors are effective because they tend to run autonomously, many investors want a more human connection to their finances. Personal Capital and Betterment both use human financial planners in their advising services, though at differing levels. For Betterment clients, human financial planners are accessible via text message for all users, including the Betterment Digital clients. In-person video chat meetings are available for Premium and a la carte Betterment clients. This wide range of accessibility allows Betterment users to access financial planning help no matter what the size of their portfolio or pocketbook. Personal Capital provides its clients with a dedicated financial planner. This is one of the ways that Personal Capital’s higher fees can be seen as an investment—you truly get what you pay for! Betterment promotes itself as a goals-based robo-advisor, and this is true. Betterment allows users to create multiple goals and track their progress toward these goals. Because of this, Betterment clients can always evaluate their financial growth against their long- (or short!) term goals. Personal Capital also has goal-tracking features, and these features are part of their free offerings. For instance, the retirement planner allows users to add milestones or goals along the road to retirement. These entries immediately change the estimated success rate of retirement, which makes it easy to see when and how you might need to adjust your finances in order to stay on target. In this category, the Personal Capital vs. Betterment robo-advisor comparison duel matches up well. Personal Capital offers their clients access to individual stocks, bonds, and alternative ETFs. Betterment offers domestic and international bond options, Vanguard and iShares ETFs, and market-cap stock ETFs. While Betterment is recognized for having a healthy mix of investment options, all Personal Capital Advisor clients can invest in individual stocks and investors have the added benefit of having their dedicated financial advisor help them look through the investment offerings. If you have a portfolio of high value (over $100,000), and want a full-service financial planner Personal Capital might be the way to go. What you pay in higher account management fees, you recoup by having a financial advisor dedicated to your portfolio and the hands-on, experienced portfolio assessment Personal Capital can offer. Don’t write Betterment off yet, though! Even though this robo-advisor might seem to be more geared toward smaller accounts, owing to its no minimum balance requirement and smaller fees, Betterment is well equipped to handle large account types as well. Those who want hands-on financial advice can get it by upgrading to Betterment Premium or purchasing a financial planning session. 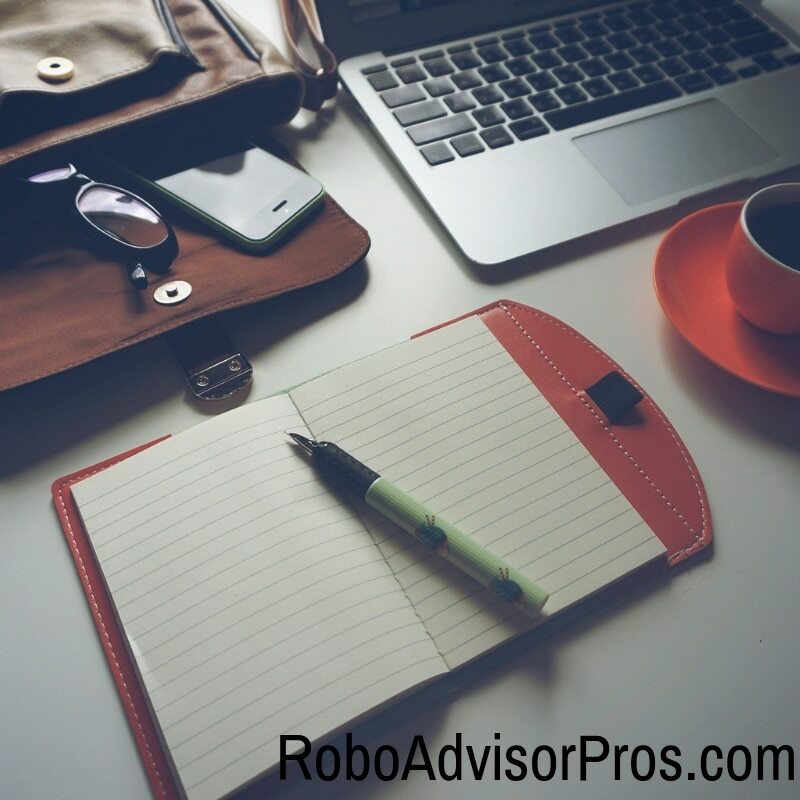 In choosing which robo-advisor might be right for you, make sure you weigh all the factors: cost, access to human financial planners, and investment offerings might be only a few of the selling points you need to consider. M1 Finance vs. Vaguard Personal Advisor Services – Should I Pay for a Robo-Advisor?